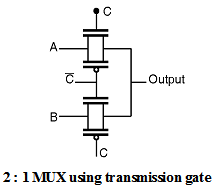 A 2:1 multiplexer is shown in Figure below. This gate selects either input A or B on the basis of the value of the control signal 'C'.When control signal C is logic low the output is equal to the input A and when control signal C is logic high the output is equal to the input B. When the control signal C is high then the upper transmission gate is ON and it passes A through it so that output = A. When the control signal C is low then the upper transmission gate turns OFF and it will not allow A to pass through it, at the same time the lower transmission gate is 'ON' and it allows B to pass through it so the output = B.